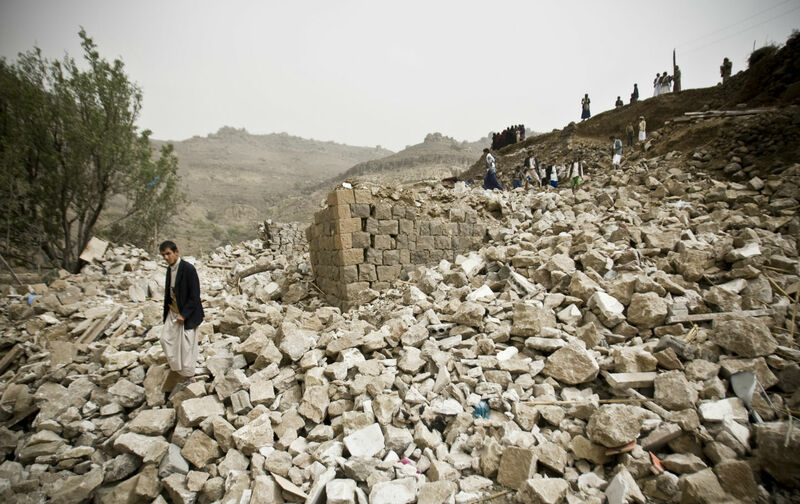 The al-Amari family was asleep in their home in Yarim, a town some 80 miles south of the Yemeni capital, when the airstrike hit, killing six of them. It was March 31, nearly a week into the air offensive launched by Saudi Arabia against Houthi rebels in Yemen. At around 2:30 AM, a missile crashed into a gas tanker, witnesses said, turning the street into an inferno that lit up the night sky and burned residents alive. “I saw horrific things,” said Mohamed Abdu Hameed al-Amari, at 32 the eldest of his siblings, and the family’s main provider. He was returning home from a late-night errand when the bomb hit. His two brothers, their wives, his 5-year-old daughter, Hanan, and his one-and-a-half year-old niece, Emada, were all killed in the blaze. Photographs sent to The Nation show the burned corpses of the victims, some of them charred beyond recognition. One of Mohamed’s surviving sons is shown in the hospital with burns over 45 percent of his body, his face contorted with pain. Mohamed’s surviving brother is in far worse condition, with burns over 95 percent of his body. His torso is wrapped in gauze, his face disfigured and swollen. “There is no hope, my family is completely destroyed, we have no more hope in life,” Mohamed said. Up to 13 others were killed in the attack. Among them are four from the al-Masary family and three from the al-Jabhy family, according to Mohamed. They all lived in the same building, its blackened facade shown in another photograph. Left with no home or belongings, Mohamed is staying with a former neighbor in his native village of al-Aghrab. 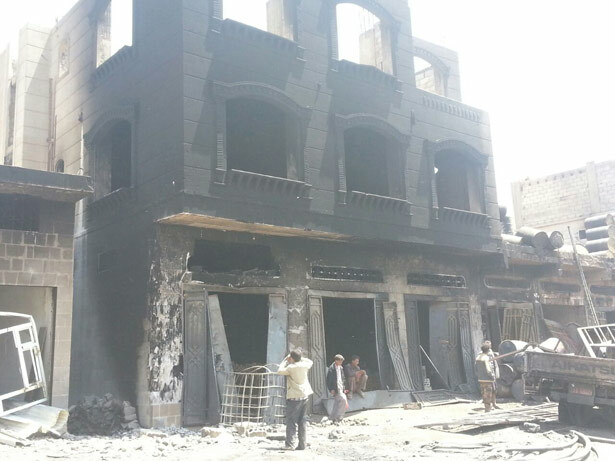 Bombings by the Saudi-led coalition have killed dozens of civilians since their offensive was launched two weeks ago against the Houthis, a militia that gained control of the capital and other parts of Yemen over the past eight months and is allied with fighters and armed units loyal to former president Ali Abdullah Saleh. The Saudi intervention exacerbated the internal conflict, with clashes erupting across the country. More than 560 people have been killed over the past two weeks, including over 70 children, according to the United Nations. The true toll is likely far higher, aid workers say. The southern port city of Aden has seen some of the fiercest fighting, with civilians trapped under bombardment, shelling and sniper fire. On Wednesday, Ahmed Haider al-Hassani, a 21-year-old volunteer first responder, was shot dead in the city. He was helping to evacuate the wounded off the streets when he was targeted by snipers fighting with factions loyal to Saleh who were positioned on the surrounding rooftops, according to his sister, Lina al-Hassani. “I am choking from despair,” Lina said through sobs. “It happens constantly. He is not the only one,” she added, listing several cases of medical workers coming under attack. She paints a harrowing picture of Aden, with corpses strewn in the streets, some for more than 12 days. The city has been without water or electricity for over a week. Salaries are not being paid, and food is scarce. Yemen was already struggling with alarming levels of malnutrition even before the Saudi-led offensive. The conflict has put the Arabs world’s poorest country under an effective blockade, with land, sea and air routes closed amid the fighting. Yemen imports more than 90 percent of its staple food items, and as supplies run dangerously low, food prices have doubled, according to Oxfam, while fuel prices have quadrupled in some areas. Meanwhile, the water system is close to collapse. With severe fuel shortages, pumps cannot draw well water in the chronically parched country. The violence is also causing massive internal displacement, with more than 100,000 people forced to leave their homes. Children make up a third of those fighting in various armed groups, according to Harneis. Yemen’s entire stock of vaccines for childhood immunizations is at risk, because of lack of electricity to keep them cool. Many schools have closed down, while others have been occupied by armed groups, in a country where 1 million children are already not receiving an education. While the fighting is rooted in internal power struggles, Yemen is increasingly being viewed as a battleground for the next regional proxy war. The conflict is clawing away at the country’s social fabric, with sectarianism injected into the local discourse as part of a regional rivalry between Saudi Arabia and its Sunni allies against Shiite powerhouse Iran. With no clear objectives by the warring sides, either at the regional or local level, the war in Yemen continues to escalate, with no end in sight.